After my presentation the participants broke into small groups and discussed what might change for each category as well as what might stay the same and what factors will likely influence what libraries will be doing in the future. Recently there have been some news stories that focus on public libraries that are offering high-tech “hackerspaces” or tech shops as part of what their services. The Fayetteville Free Library in New York State is developing a “Fab Lab”, a free high-tech space that allows users access to machines and software in order to design and fabricate things. What things, you might ask? So far except for 3D printing the predictions are a little vague. The products will be most likely be moulded out of plastic (although the high-tech fabrication machines also work with wood and other materials), they will be three dimensional, and they are meant to be functional; lots of opportunity for the DIY set, in other words. 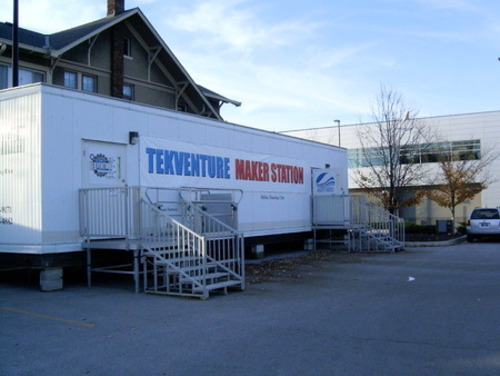 The Allen County Library in Fort Wayne, Indiana has another example they are calling the TekVenture Maker Station. TekVenture is a non-profit organization with a tag line that speaks to interconnecting imagination, technology and community. It and the library are partners in this small but ambitious endeavour. It’s much too early to know whether these efforts will be adopted more broadly and become more mainstream. But they do speak to all five of the library categories offered by Prof. Janes. In this case the users create the stuff with the help of the library that provides a place for learning through interaction or collaboration with partners so that creators can interact with others in their own learning. As for values, Allen County Public Library’s director, Jeff Krull says that libraries are “in the learning business and the exploration business and the expand-your-mind business”, and so he says, the Maker Station fits with the library’s mission. If you want to hear the radio coverage of these efforts that was aired by CBC’s Spark program here is the link to the podcast of the episode (#166). Scroll down to the audio portion called “Hacking the Library”.